Action from a recent Peterborough NECI (blue) game. Peterborough NECI are determined to take advantage of a second shot at PFA Minor Cup glory as they continue their pursuit of an honours double. The first-season Peterborough League club were beaten 3-1 by Premiair in the quarter-finals last month, but the Division Four table-toppers were thrown out for fielding an ineligible player. NECI, who are hot favourites to win Division Five, now tackle another top Fourth Division side in Cardea at PSL tomorrow (March 18. 2pm) in the semi-final. “Our expectations were quite high at the start of the season,” NECI player-boss Antonio De Paolo stated. “We have some good players for our level, but to win a cup and the league would be a great effort. NECI returned to the top of Division Five with a resounding 6-2 win over city rivals Orton Rangers last weekend. Daniel Leach (2), Karl Down (2), Julio Garrido and Andrew Cook scored the goals. Cardea have already won one cup competition this season. 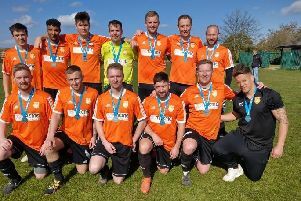 They won the Hunts Lower Junior Cup Final last week beating Fenstanton Reserves 3-0 with goals from Kieran Hart (2) and Kelvin Fletcher. Division Five outfit British School of Sports await the winners of tomorrow’s semi-final in the final.